On patrol: The Korean War Memorial on Washington’s National Mall. 1/250 sec., f/5.6, ISO 100, 32mm. THERE IS NO GREATER ART THAN THAT WHICH DEMANDS THAT THE VIEWER BECOME A PARTICIPANT, an active co-creator of a bond between creator and user. That is the ineffable power that pervades all great art; the ability to draw you into a world not your own, a world which, in an instant, becomes your own. This elusive quality moves art from mere depiction to a kind of partnership arrangement. It’s so uncommon, so rare, that, when we see an instance of it, the very nature of the effect is radiant, unforgettable. There are many attempts along Washington, D.C.‘s National Mall to name the nameless, to five utterance to the wordless qualities that define greatness, vision, loss, courage, passion, and pain. America‘s noisy, erratic journey through its young life have left trails of triumph and tragedy, paths that artists have illuminated with the various memorials and monuments which ring the mall from east to west. Some elevate presidents to the level of demigods; some mark the passage of noble laws; others, like the Vietnam War memorial, evoke deep feeling with a reverent stillness, and my favorite, the more recent Korean War Memorial, captures the quiet terror of setting out upon the grim errand of battle in a way that is eerie, and yet elegant. 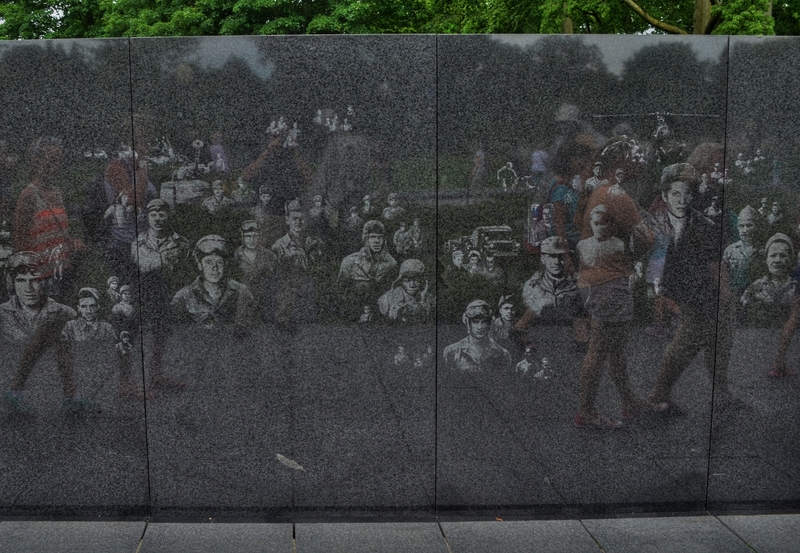 Visitors to the Korean War Memorial pass a wall etched with candid photos of G.I.s who served in the conflict. No majestic slogans mark the monument; only the cautionary sentence “Freedom Is Not Free” serves to warn the visitor that every act undertaken by politicians and kings has a real cost for real men. That cost is also recorded on the monument, with the dead, wounded, captured and missing totaling 172,847 Americans, not to mention the losses of the other twenty-two United Nations members whose soldiers comprised the total war effort. To stand at many of the National Mall’s war memorials is to deal in abstractions…..patriotism, truth, sacrifice…noble words, noble ideals. 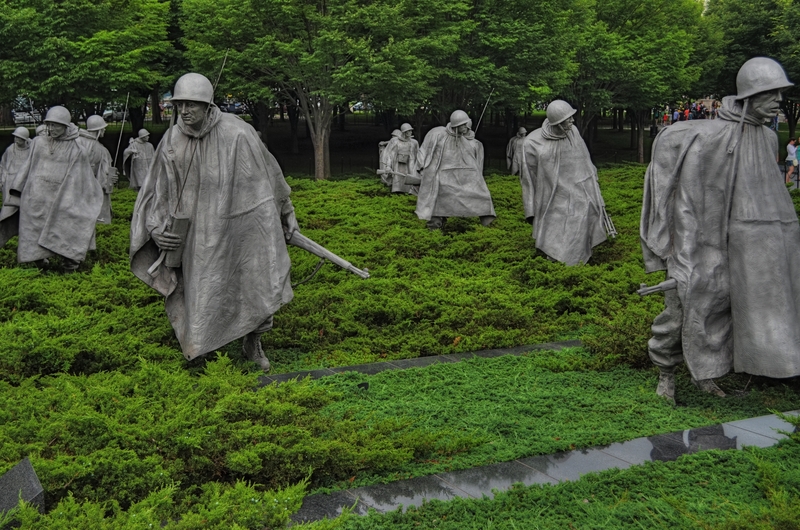 To stand at the Korean War Memorial is to feel the blood and bone of war, its terror and tension, its risk and reality. It is the greatest kind of public art, because the public are destined, always, to become a vital part of it. This entry was posted on June 25, 2013 by Michael Perkins. It was filed under Composition, D.C., Exposure, Memorials, Monuments and was tagged with Korean War, Korean War Veterans Memorial, Lincoln Memorial, National Mall, Vietnam Veterans Memorial.